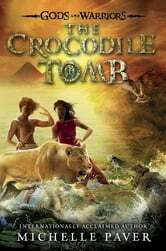 Hylas and Pirra finally arrive in Egypt, only to find that the dagger Userref guarded is missing. Even worse, Telamon and the Crows are also in Egypt to hunt for the dagger, and they'll stop at nothing until they get what they've come for. But when Hylas realizes where the dagger is hidden—in Egypt’s ancient tombs, buried with the restless souls of the dead—it's going to take all of his courage to slip inside. And as his otherworldly visions grow stronger, Hylas isn't confident that he'll have the strength to make it out alive. With Havoc the lioness and Echo the falcon at their sides, Hylas and Pirra must rescue the dagger and make a daring escape...before the gods of Egypt consume them all.